My mother really does not like cake. I know, such a strange egg (wink wink, just joking Mum, but really it is a little strange). She also doesn’t like chocolate, lollies, ice cream and cookies. Okay yes, no more joking Mum, you are strange! In case you’re wondering I do like, scratch that, LOVE cake, chocolate and ice cream and I’m quite partial to the odd sweet or cookie. As you might have suspected, I have on multiple occasions questioned whether I’m in actual fact adopted, but I know this is not the case because people say we look far too alike. On a daily basis her dislike of treats doesn’t prove to be much of a problem, apart from when I go home for a visit and there is a significant lack of dessert. I guess this is really a good thing because when I returned home after visiting over Christmas I had actually lost weight – who loses weight over Christmas? This was certainly not my intention. So this dislike of sweet things is not usually a problem, a lot of people would love to have my mother’s palate, but it does prove to be some what of a problem at birthdays. I can’t very well give her a birthday salad or perhaps some birthday chicken liver pate with a candle stuck in it? In the past we hadn’t always insisted on a cake at everyone’s birthday but now with a birthday-candle-blowing-obsessed toddler around there is no escaping a birthday without a cake, candles and usually a hooter or two. So what do I do on my mother’s birthday? Seeing as birthdays aren’t really about us grown-ups any longer and they’re all about the toddler (like all other aspects of my life!) then I could just make a chocolate cake and be done, but I feel that the birthday girl has to at least enjoy a little of the cake. 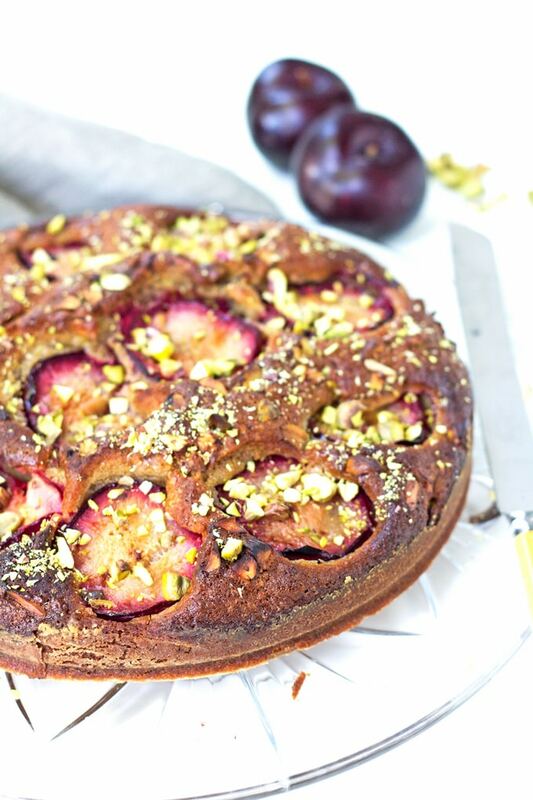 Enter my Plum and Pistachio Cake. My Mum loves it. Yes, my cake hating mother just loves it! I first made it for her a couple of years ago when she came to stay on her birthday and she even had seconds! It’s light and moist and not at all too sweet which makes it perfect for my Mum. 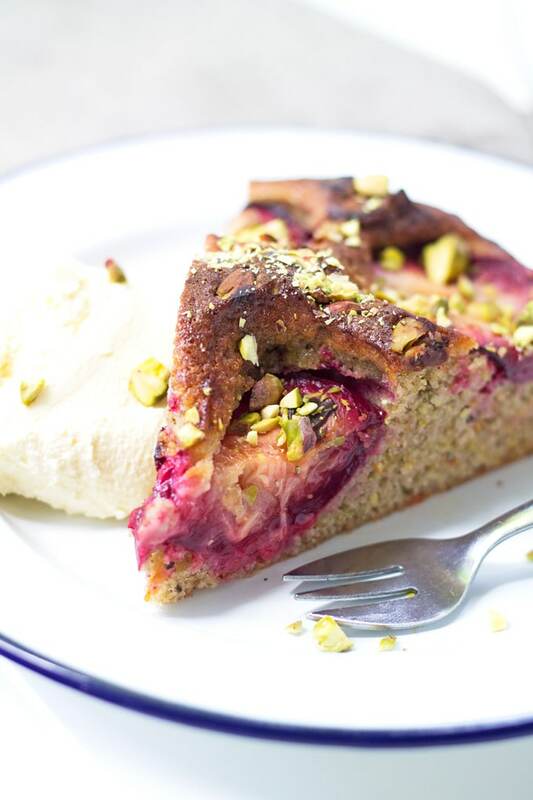 The plums on top give it a lovely tangy flavour and the pistachios, orange zest and cinnamon give it a lovely depth of flavour. 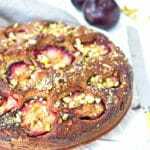 It looks so pretty with the green pistachios and purple plums and is really so simple to make, I think the most difficult part of it is getting out the heavy food processor to grind the pistachios. Of course, there’s no creaming the butter required (anyone who reads my blog knows my dislike of this, although I do appreciate it’s necessity in other cakes) just pour in the oil and be done! 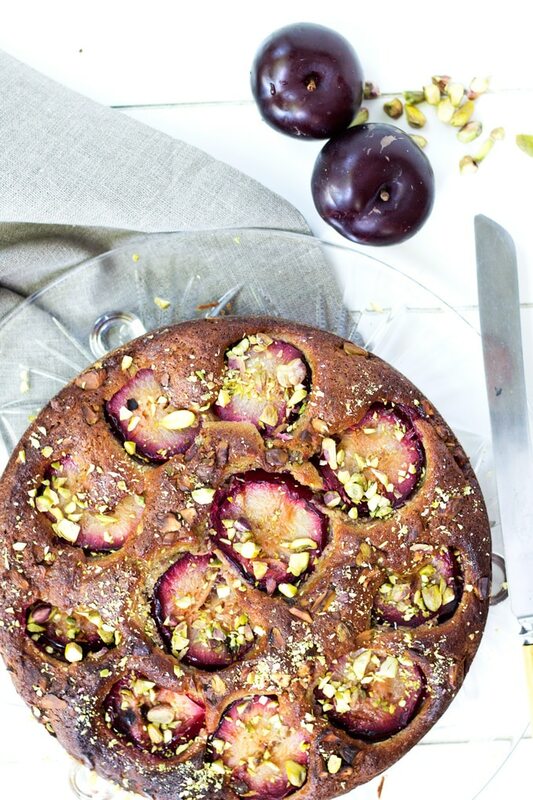 At this time of year there are so many beautiful plums available and whilst I do think this cake is best with plums, it is also great with any other stone fruit, even cherries if you can be bothered removing their stones. What’s more you can even use tinned plums when the fresh ones are out of season. Roll around July and I’ll be making this cake again for my lovely mother if I get to see her. 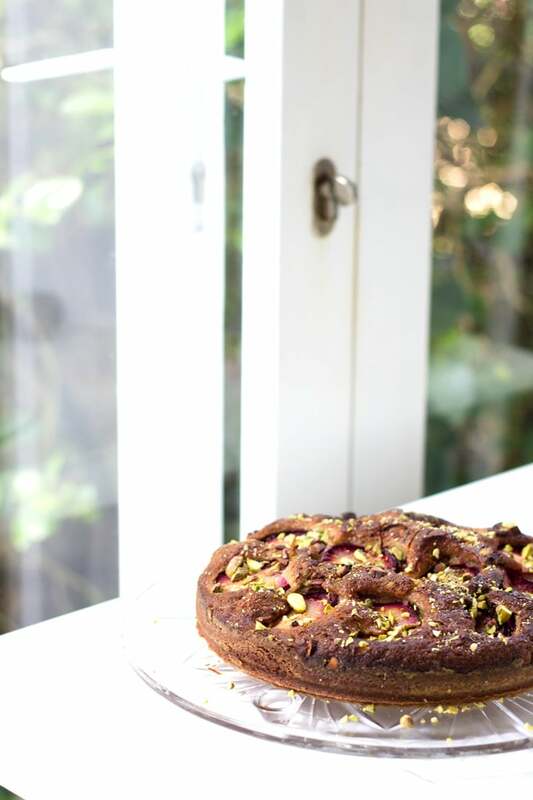 Unfortunately she lives on another island to me so I don’t get to see her as much as I would like and despite my Plum and Pistachio Cake ticking many boxes it doesn’t post very well! 1/4 vegetable oil e.g. rice bran, canola, grape seed, etc. Preheat oven to 180C/350F bake (160C/320F fan-bake). Grease and flour a 25cm (10in) springform cake tin. This cake batter is quite sticky so I find it difficult to spread in the cake tin if it is lined therefore I recommend you use a springform tin that has been greased and floured (see note). Place 1/2 cup pistachios in a food processor and process until they resemble fine breadcrumbs (don’t over process or you might make pistachio butter!). In a large bowl sift together flour, sugar, baking powder and cinnamon. Add orange zest and ground pistachios and stir to combine. In a separate bowl (or large jug) lightly whisk together milk, oil, egg and vanilla. Make a well in the centre of the dry ingredients and add the wet ingredients. Stir to combine. Spoon the mixture into the cake tin. 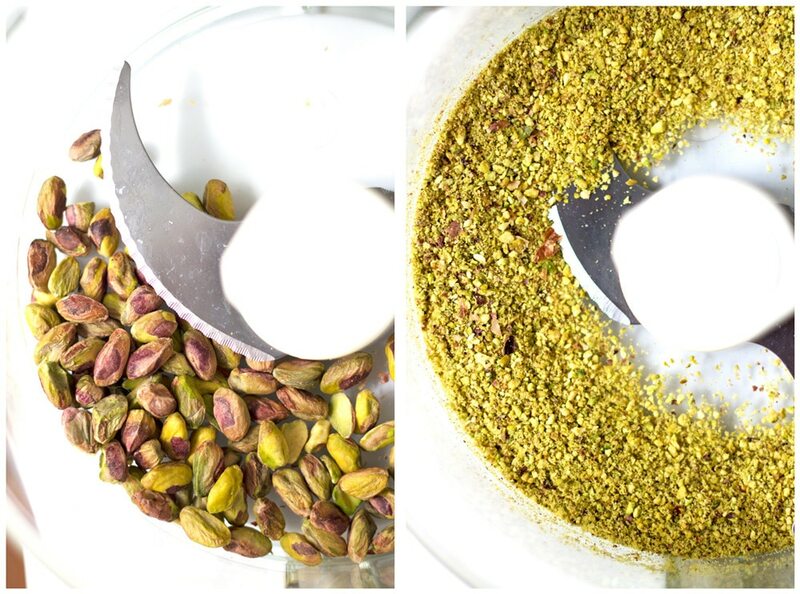 Sprinkle over 3 Tbsp of roughly chopped pistachios. Arrange halved plums on top of batter and divide butter into small knobs and scatter over the plums. Place in the oven and bake for about 40-45 minutes or until cake is cooked and a skewer comes out clean when inserted into the cake. Allow cake to cool in tin for 10 min then transfer to a wire cooling rack. Roughly chop remaining 2 Tbsp pistachios and scatter over the cake. Serve warm or cold with a dollop of yoghurt or mascarpone. Best eaten on the day however will keep up to 2 days in an airtight container. Note: To grease and flour a cake tin first rub the entire inside of the cake tin with butter or alternatively brush with melted butter using a pastry brush. Then sprinkle in about 2 heaped Tbsp of flour and keep turning and tapping the cake tin until all of the inside sides are covered with flour. Tip out any excess flour. So accurate. Funny thing I do enjoy baking. Even when I was a child (a long time ago) I did not like birthday parties because it was always ice cream and jelly to eat. Kate, you didn’t mention coriander!!!! Yes, how could I forget coriander (cilantro) one of my absolute favourite flavours! Strange lady (wink wink)!